Pest description and damage Scale insects are common on many ornamental trees and shrubs, groundcovers and herbaceous plants. Adult female scale live under a shell-like covering that resemble "volcanoes," "barnacles," "hemispherical bumps," "cotton puffs," "oysters" or may appear to be flat, soft and naked, with various dull colors and markings. They are often found attached along the branches, twigs, leaves or needles or even fruit. 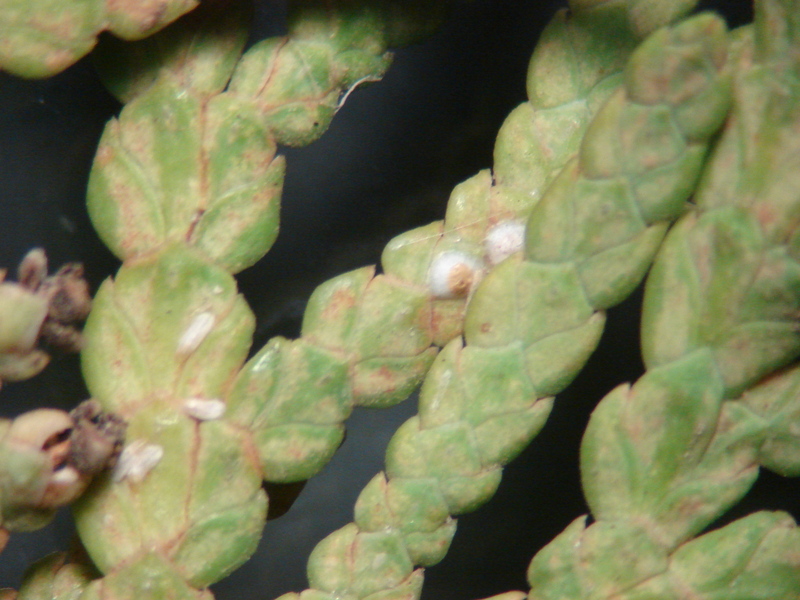 Most scale insects are from 0.0625 to 0.25 inch long. These insects have piercing-sucking mouthparts that they inject into plant tissues to feed on plant juices. Occasionally, large populations of scale can devitalize plants and retard growth, as well as discolor the foliage. Severe infestations can kill twigs. In many cases, a large quantity of honeydew is produced that makes leaves and fruit shiny and sticky. Honeydew can collect on decks, lawn chairs and other landscape surfaces and become an intolerable nuisance to homeowners. Sooty mold fungus may grow on the honeydew giving the plants a dirty, sooty appearance. Biology and life history The life history varies with species, so accurate species identification is needed. 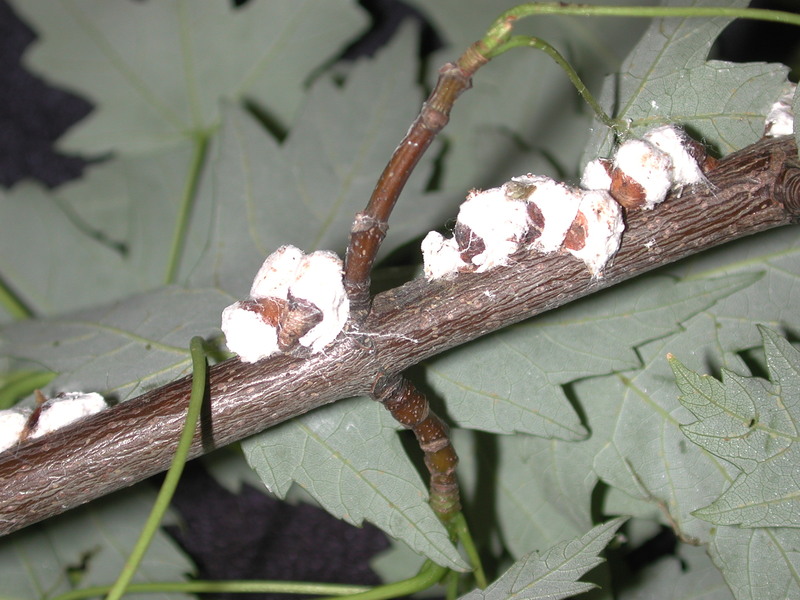 Generally, scale insects overwinter as eggs concealed beneath the female parent's scale, or as immature scale on twigs and branches. When scale overwinter as immatures, they resume feeding in the spring, and eggs are laid later in spring. When scale overwinter as eggs under the protective scale, they hatch from spring to late June. Young scales are called "crawlers." The crawlers are highly mobile and disperse through the foliage to find a new feeding site. Occasionally, these crawlers can be dispersed from plant to a new host plant by wind or air currents, rain, birds, irrigation or by the movement of people and machinery. When they find a suitable site, many insert their mouthparts, molt and lose their legs, and become non-mobile. They then form the wax or cottony scale that conceals them. Scales feeding on the leaves of deciduous plants can move back onto the branches in late summer or fall. Adult males may be winged or wingless and seek out the non-mobile adult females. There will be one or two generations per year for most scale species. 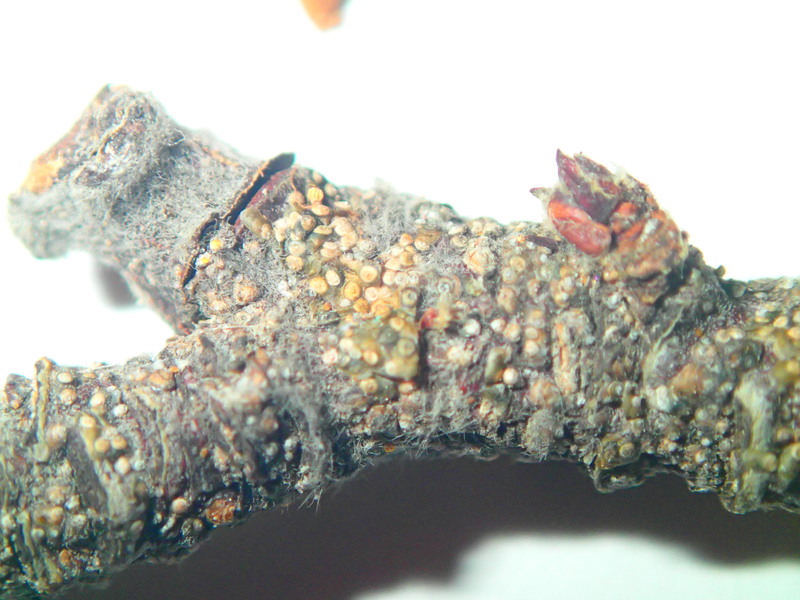 Pest monitoring Inspect twigs and tissues during the dormant season for scale insects. Pay attention to sickly plants and those with low vigor. The scale crawler stage is most susceptible to chemical control measures. Monitor the movement of newly hatched crawlers by wrapping a piece of sticky tape around an infested branch with the sticky side out. The crawlers are very small and best observed with a 10X magnifying glass. Check beneath scale for live females or eggs, or for predator mites or parasitoid wasp grubs. Fluff beneath scale could indicate parasitoid activity or that the eggs have hatched. Holes in scale indicate parasitoids have emerged. Scrape scale off plants by hand with fingernail or toothbrush. Prune off major infestations in trees and shrubs if possible. Apply tape, sticky side out or use a similar adhesive near infestations of adult scale to intercept and catch the crawler stage. Water landscape plants and trees properly, as drought-stressed plants are more susceptible to scale insects. Avoid excessive nitrogen applications as this encourages growth in scale insect populations. Generally, pesticide applications are applied to the vulnerable crawler stage before the scale covering is formed. The waxy scale cover of these insects tends to conceal and protect them from generalized predators and from some pesticides. Even so, there are numerous predators that specialize in feeding on scale insects including birds, lady beetle adults and larvae, mites and green lacewing larvae. There are also numerous species of minute wasps that lay eggs in and parasitize scale insects. Biological control may prevent significant scale infestations. Avoid broad-spectrum insecticide applications that would disrupt these natural enemy populations allowing the scale to reproduce. Some sites below provide more detailed information on some of the scale species. Hatching dates and life cycle info may vary slightly with the origin of information. Ignore pesticide recommendations from other states as they may not be registered in the PNW or may be off label use for our area.